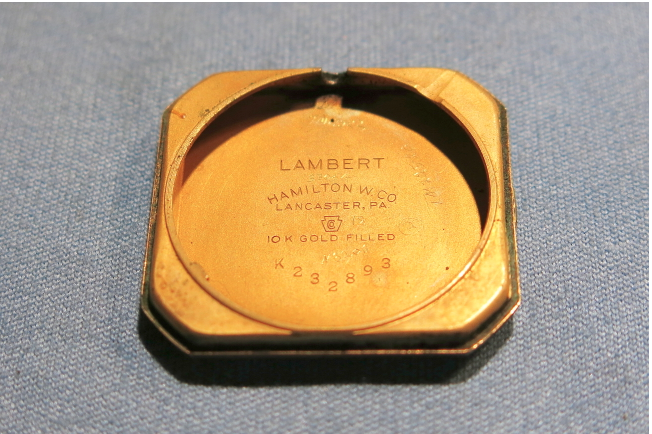 In 1950 Hamilton introduced the Lambert, a square-shaped watch with unusually wide lugs at 11/16 inch (18mm). 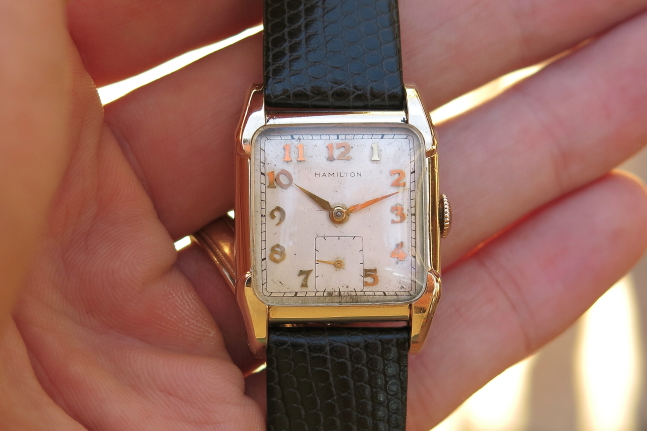 I think most watches in the line up had a lug spacing of 5/8 inch or the equivalent of 16mm today. 18mm is not unheard of though - just atypical. 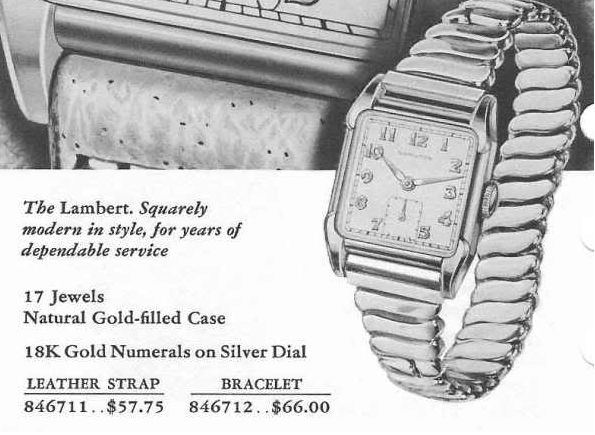 The Lambert came with only the AGN dial pattern on a sterling silver dial with solid gold numerals. The case is 10K yellow gold filled. 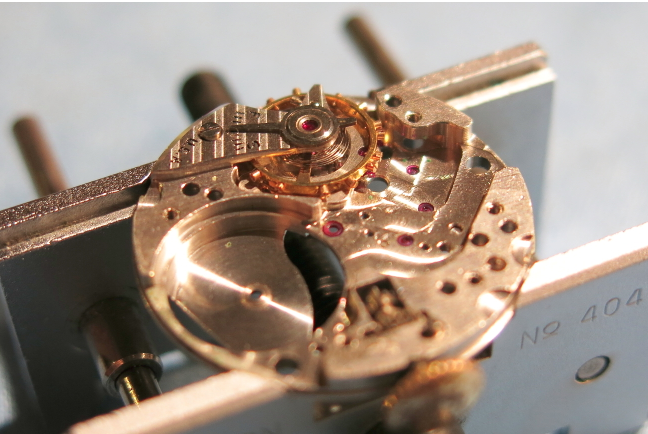 Under the dial is an 8/0 sized, 17 jewel 747 movement. I recently purchased a Lambert that was pretty beat up. 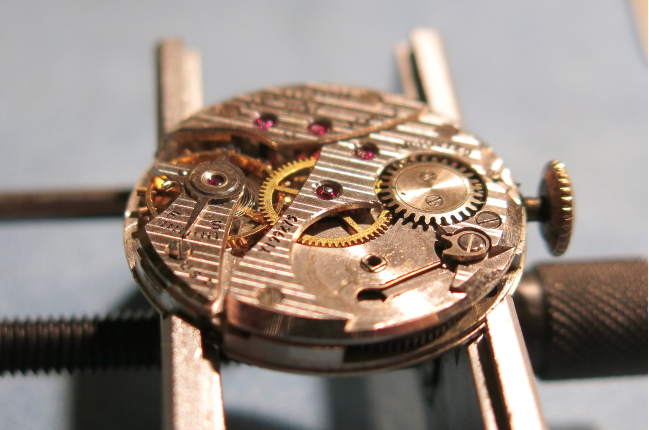 I thought it might just be a spare movement but the case is actually in really good shape - just awfully dirty. 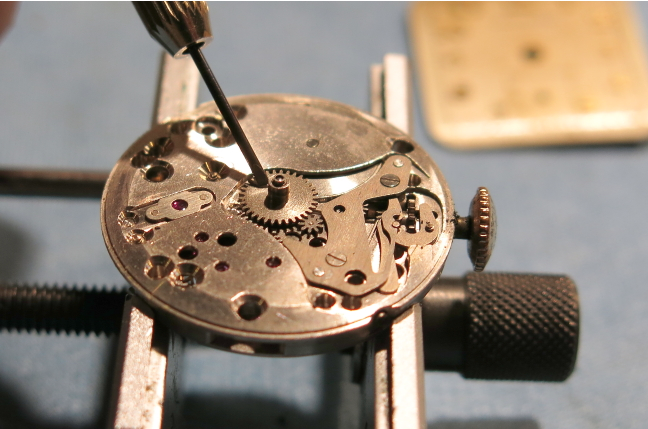 The start of any overhaul is pulling the movement from the case. You can see in the photo below that this dial is filthy. I'll do my best to clean it but this could be a candidate for refinishing. 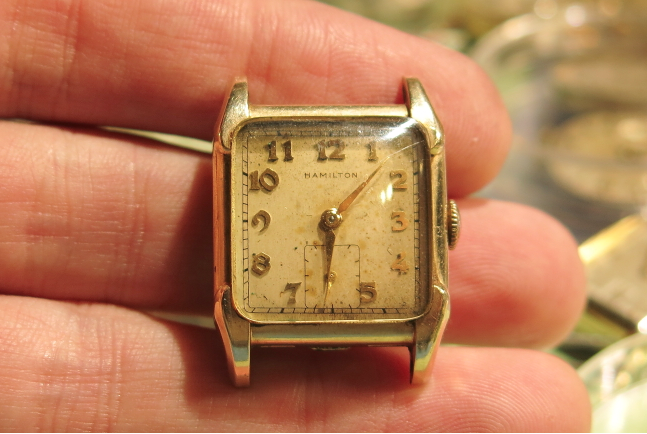 Hamilton often put the model name in the case back. It's not always there though... maybe half the time at best. 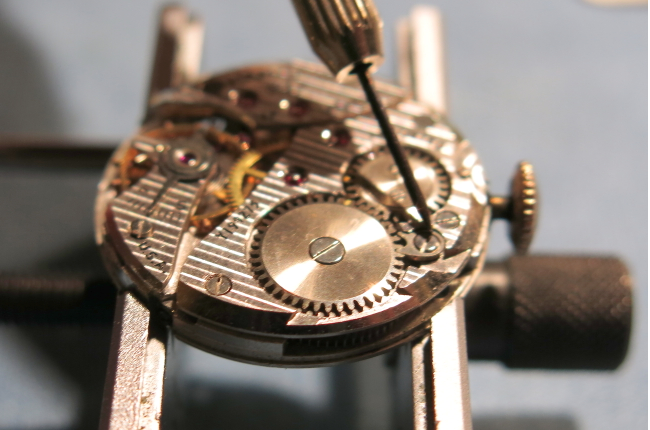 Despite this watch's poor condition, there are lots of watchmakers' marks inside telling me the original owner of this watch cared enough about it to get it regularly serviced. 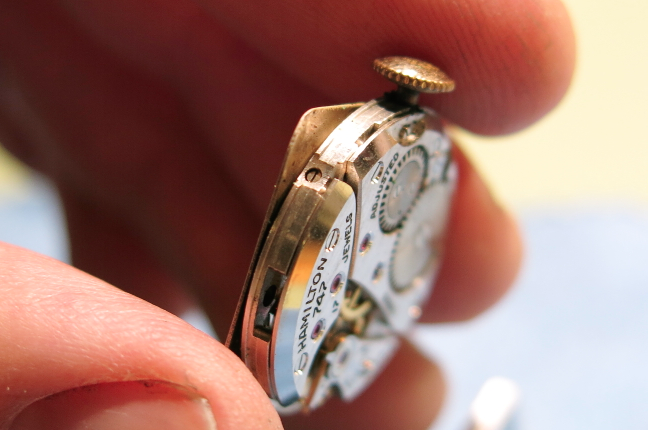 With the dial secured in my movement holder, I can remove the hour and minute hands. The second hand will come off when I pull the dial. 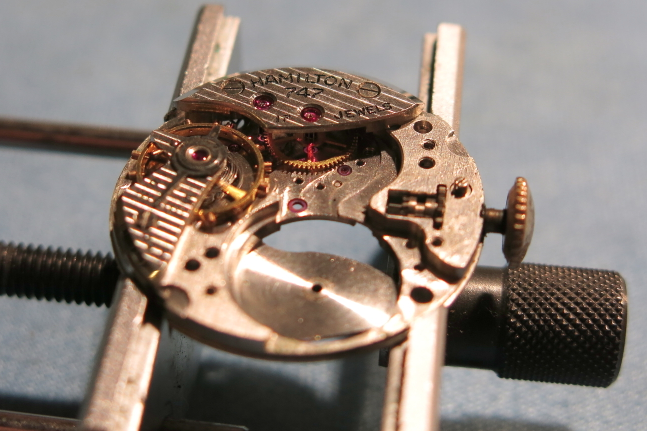 The dial will come off once I loosen the two dial foot screws on opposite sides of the movement. With the dial removed, the next step is to pull the hour wheel and the cannon pinion inside of it (my screwdriver is pointing to them). I'll also remove the set bridge (also known as a yoke) which is between the hour wheel and the crown and held in place by the two visible screws. 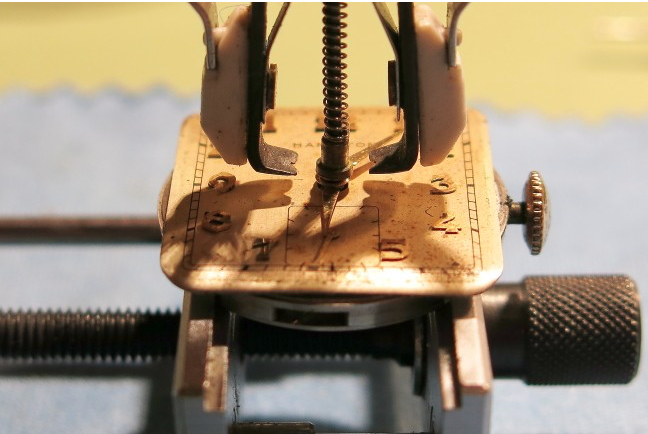 Flipping the movement over, I will now release the mainspring tension by holding "the click" open with a screwdriver while gently letting the tension off by allowing the crown to rotate backwards in my fingers. 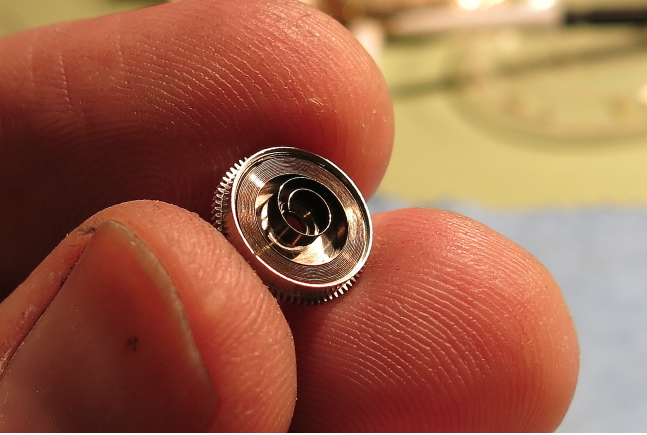 With the tension let off, I can remove the mainspring ratchet wheel. 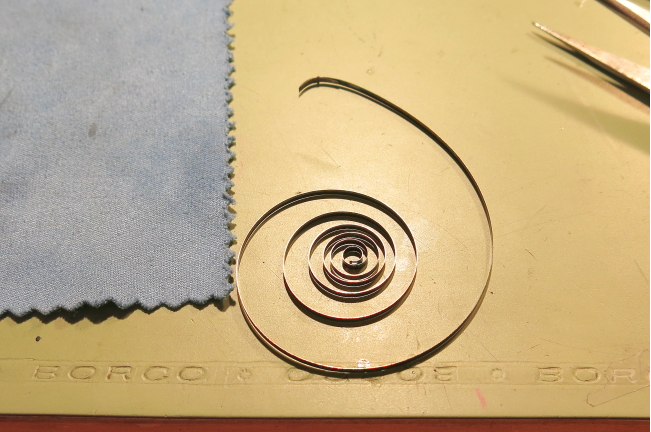 You can now see the mainspring arbor poking out. Just below it is the "click spring" - a little j-shaped spring that is a pain to install and easy to lose if it shoots out of the movement. Three screws hold the "barrel bridge" on and once they're removed the mainspring barrel is visible, along with the center wheel and the third wheel. All three are removed. Now I can remove to two screws holding the train bridge on and pull the fourth wheel and the escape wheel. One screw holds the balance bridge and balance assembly in place. They come of next. Finally, two screws hold the pallet fork bridge in place. Once they're off, the pallet fork can be removed and everything is ready for cleaning. 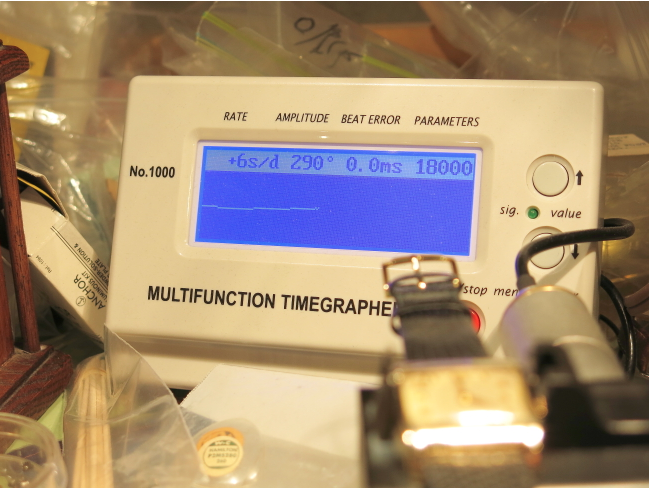 While the parts are in the ultrasonic cleaner I turn my attention to the dial. A lot of people ask me what I use to clean dials. There are a lot of "secret sauces" out there. I use an ultrasonic jewelry cleaner concentrate full strength. Let it soak, rinse in cold water and repeat until clean. Slowly the grime comes off. The trick with cleaning dials is to know when to stop. 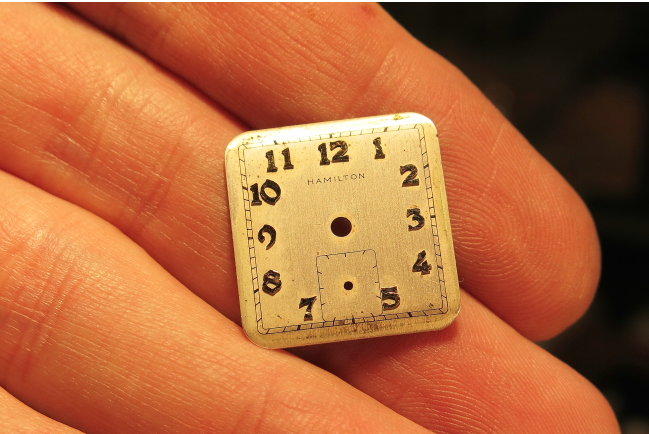 This one got pretty clean but you can still see some patina around the numerals. I could get it cleaner but I would probably lose the printing so as Shrek would say, "That'll do, Donkey. That'll do". 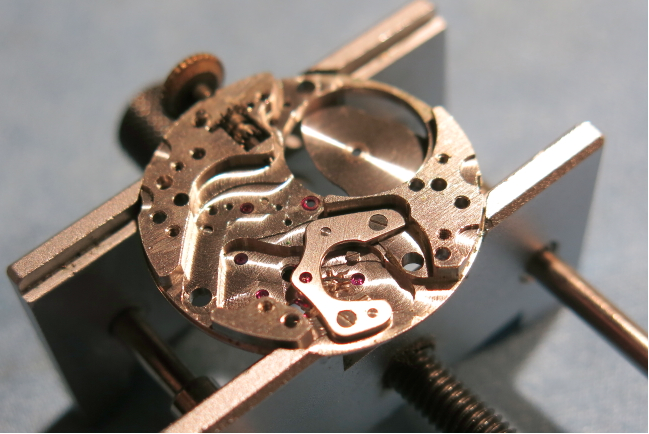 This watch has a blue steel mainspring in it - a sure sign that this spring could stand to be replaced. To get it out is easy - you just pull out the center part and it will spring out. You need to be careful though as it will come shooting out if you're not holding it right. It's not the worst spring I've ever seen... but it should splay fully out and coil slightly in the opposite direction - so this spring will be replaced. I use L&R ultrasonic cleaner and rinse. I have three jars... one with cleaner and two rinses. The cleaner turns cloudy after a really dirty watch or after a couple of semi-dirty watches. I change it when it gets cloudy. After 8 minutes in the cleaner it goes into the first rinse. Then after 5 minutes in the first rinse it goes into the second rinse. Then I let it dry. While the ultrasonic is doing it's thing, I turn my attention to the case. It's been in the ultrasonic too - which, as usual, removed the crystal. 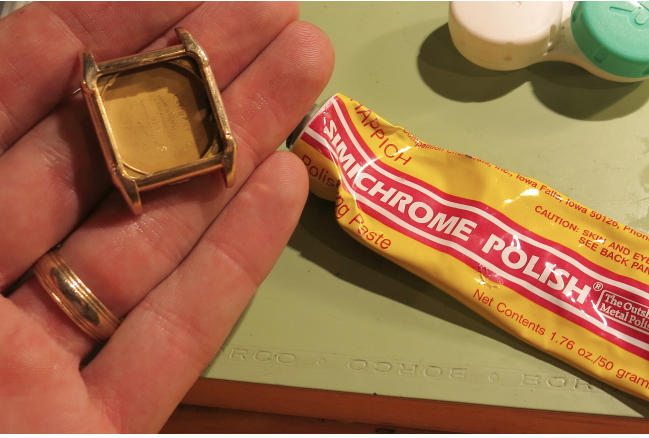 I'll re-glue it after I polish the case with Simichrome. 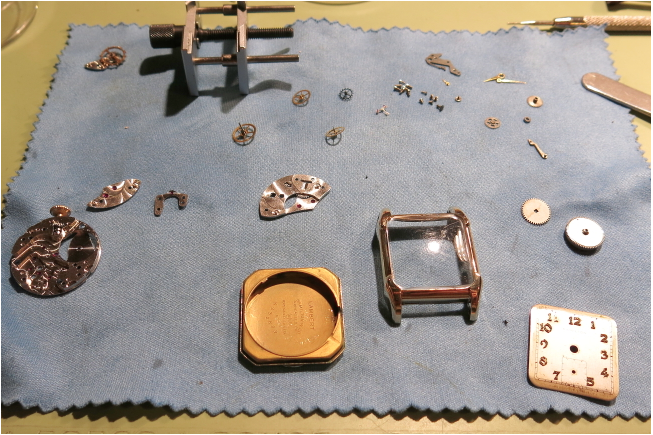 Everything is cleaned, polished and dried - now for some reassembly. It all goes back together the opposite way I took it apart. However, I always put the balance on last. With it all back together, it goes on the timer. Running 6 seconds fast per day, lots of amplitude (290 degrees) and very little beat error. This is a nice running 747, for sure. And here it is with a nice black strap. The crystal has some scratches so I'll replace it. The dial is fair... I'll have to think about getting it redone. 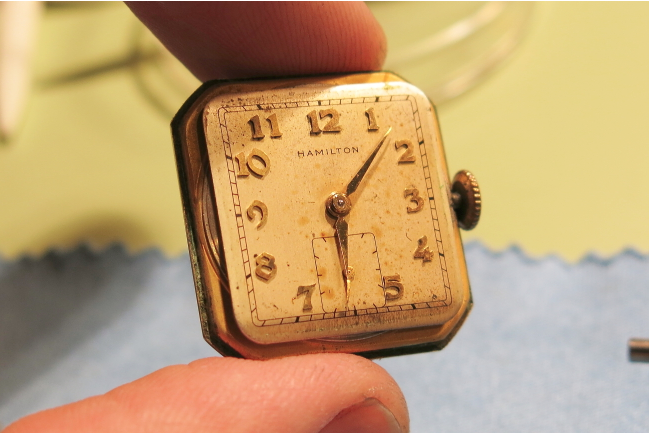 An original dial in fair shape is often favorable to a nice refinished dial.... this is a tough call. Just for fun - use the comment box below to let me know what you'd do... refinish or leave it original? I purchased a "Lambert" last winter which, fortunately, was in pretty darn good shape. 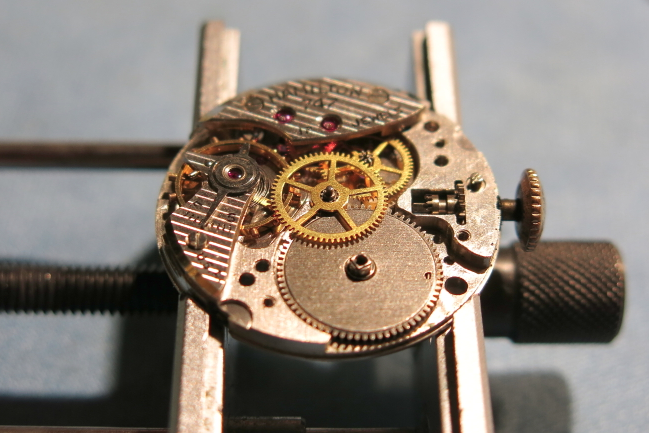 This posting is a good education for a collector, even one who has spent hours with watchmakers trying to understand the intricacies of a movement. Dan: I see that you used the ultrasonic jewelry cleaner concentrate at full strength to clean the dial (primarily to remove the patina). Forgive me for being ignorant, but I see you are using a lid, which appears to have a greasy substance that the dial is resting on. 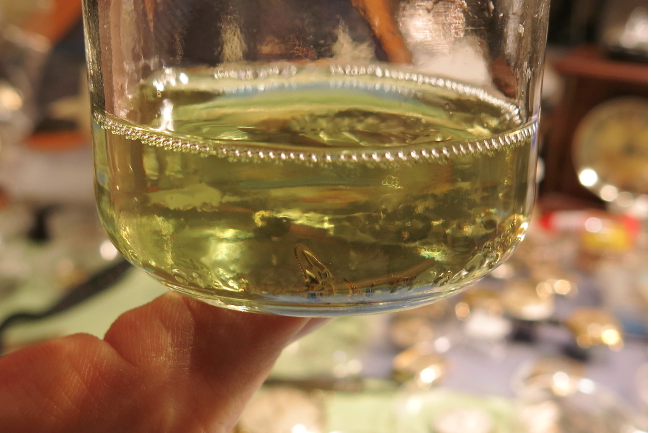 Behind it in a glass appears to be the jewelry cleaner concentrate, which is the color red. No picture shows the dial submerged in any liquid. Am I missing something here? How are you applying the cleaner, because the dial doesn't appear to be soaking in it? Ah... the lid isn't greasy, that's just the cleaner. 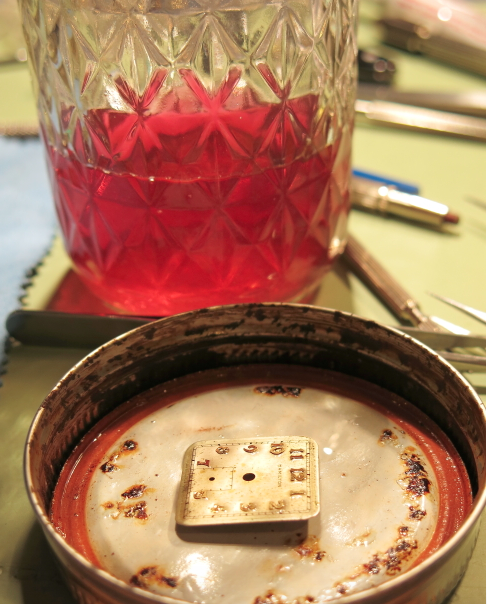 The dial was in the jar and when I took it out I put it on the lid for the photo. The extra liquid is from the dial. 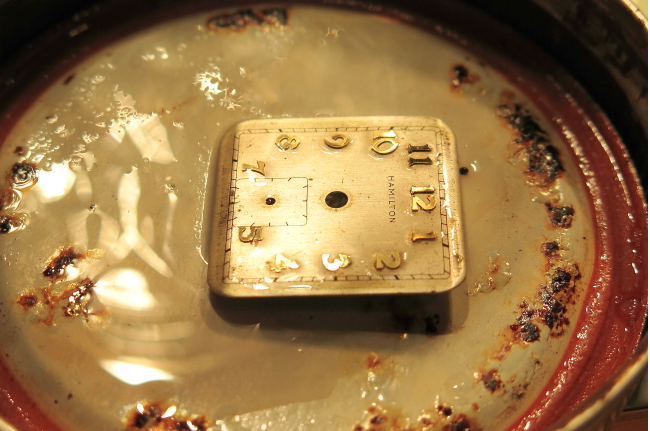 The dial is still wet with the cleaner though... so it's still soaking. So do you just dip it in the cleaner for a couple of seconds and then let it soak on the lid? And if it doesn't clean it in, say, 10 minutes, rinse, dip, and wait again? Yup - but I let is soak for about a minute, then rinse, and repeat until I like the results. The trick is to know when to stop before it gets too clean and the printing fades. It's best not to even try it unless you're willing to get the dial redone. Awesome. Very helpful. Thank you. Everything explained in great detail! Thanks! how do you remove the crystal? You push it out from the inside. If it's stuck you can boil it.